They come to me smells of coffee come to the thought newly made and visions of the garden to the dawn, dressed in a cap of haze and hoar-frost, green, in infinite tones, standing out darker those under a cloaked sky, you upset awake. In the horizon the fight between the Sun and the clouds, the flight of the night. Meanwhile, the trills of the birds compose the sonorous band of the day. Suddenly, from the distance, a new instrument passes to increase the already powerful orchestra of the birds. He is probably the most ancient musician of the unexpected orchestra. Other singings, other hisses filled the air time behind, accompanying his unmistakable sound; while his notes were perforating the haze, entire generations have happened, being born and dying inexorably for a lot of time. It is one more component of the garden, which zigzags between still slept orange trees. His light disperses in the countless sparkles of the drops of dew. His color is the same that that of the darkest leaves; his movements encircled by the tracing of the way, accompany of a soft cadence in an odd allegro ma singular troppo. It transports lives and hopes, passions, desires, illusions, frustrations... He is a friend of all except of those that cross in his way at the wrong time. With everything, it continues being popular and dear without the reputation has raised him to his head of wood and metal. It is the trenet. Of all this, already thirty years ago. It was the first contact, the first impression that me there caused those old trains that so much service gave Valencia. Nowadays almost quite it has changed except the tracing. The old men convoyes already do not circulate, they were a pasture of the blowpipe. Others, much replaced them more comfortable and rapid, though, certainly they do not have the same captivation. Of the “estacioneta” of the Pont of Lash, only the building stays, so everything what was the beach of routes, the platforms and other facilities it is now only a recollection, a photography. Supporters and detractors will not stop discussing the suitability of the changes, on past and future. But for the present time, in the present, the systematic one of progress and of the technology it has won completely to all those romantic visions of the trenet as it was. The result is evident: a better service, a major comfort, a completely different image. The times change. We also. But, lucky, always the history stays. And with this history I am going to try to deal, concretly, with 110 years of history of the trenet. 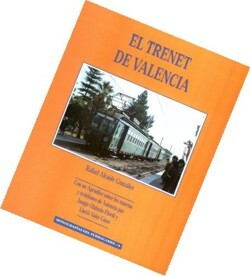 An exciting and wonderful history, which is not other one that the history of Valencia and the Valencian ones, of his vicissitudes, of his daily experiences adorned with those unforgettable traqueteos and hisses that dominated the garden, which they lived and which they coexisted with the daily occupation of many men and women.